In [this video](https://youtu.be/m2X-ZalBFCE?t=13m11s) that shows longtime U2 guitar tech Dallas Schoo inspecting Edge's Bob Bradshaw-designed rig prior to 1997's PopMart Tour, a Small Cone pedal is visible at the [15-minute 31-second mark](https://youtu.be/m2X-ZalBFCE?t=15m31s). Cobain had a Small Clone chorus from Electro-Harmonix in his pedalboard. This site mentions Emily having an Electro Harmonix Small Clone on her pedalboard. 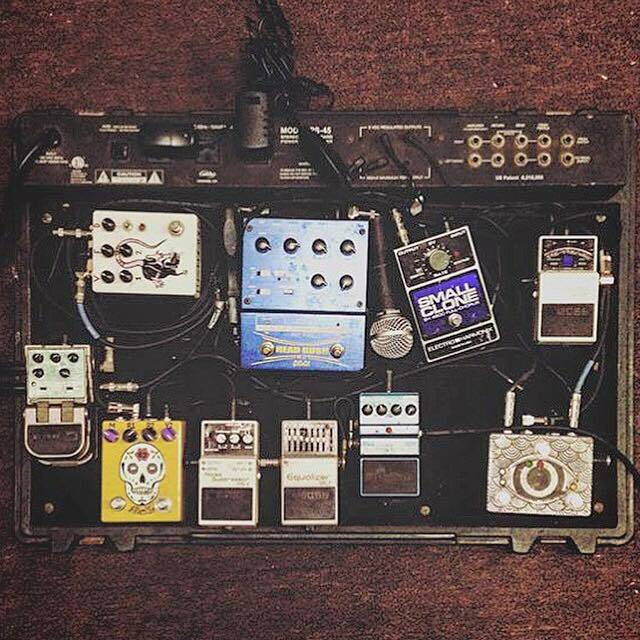 In this pedalboard photo, which was uploaded by Bynum on his Instagram profile, one of the pedals that can be seen on the board is the EHX Small Clone analog chorus. From a Tone King video, with Jeordie and his guitar tech (he's playing guitar in Marilyn Manson) explaining and showing his current guitar effects for Marilyn Manson. 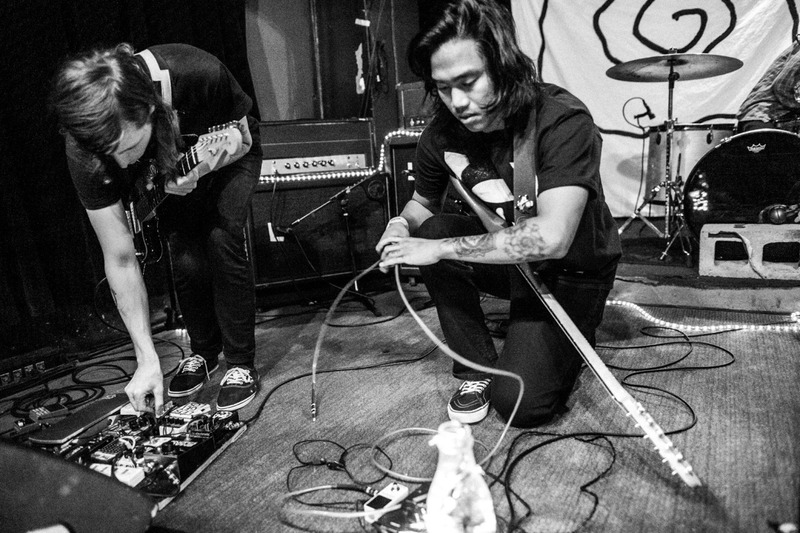 In this image from Premier Guitar, John is using a Small Clone in his effect pedal setup. According to this page, Billy uses EHX Small Clone chorus pedal. 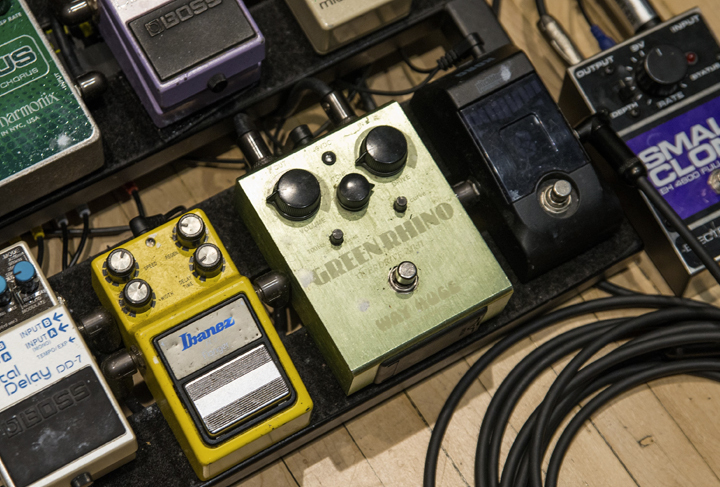 In this photo, Lloyd's pedalboard is visible, which shows the EHX Small Clone in the board. According to Guitar Geek's rig diagram, Mascis used this pedal. Middle row to the right of Keith Murray's pedalboard, his Electro-Harmonix Small Stone Phase Shifter can be seen. In [an interview](http://images.equipboard.com/uploads/source/image/34972/uhXGb4d.png), when discussing his pedalboard and signal chain, he says: > Then it [MXR Carbon Copy] goes into, um, an unused Electro-Harmonix Small Stone? [at Brendon] is that the name of the phaser pedal? Which I used to use on a couple of the [Brain Thrust Mastery](https://en.wikipedia.org/wiki/Brain_Thrust_Mastery) songs–doesn’t get used now. We don’t even touch the tunes that it used to be on. **EDIT June 2016:** In [this email exchange with Keith Murray](http://images.equipboard.com/uploads/source/image/36348/GU1NHzQ.png), he points out a correction for his Equipboard, that "the pedal listed as a Small Stone is actually a Small Clone chorus pedal." "more geek fodder-soundcheck shot of the excess-keep it simple? 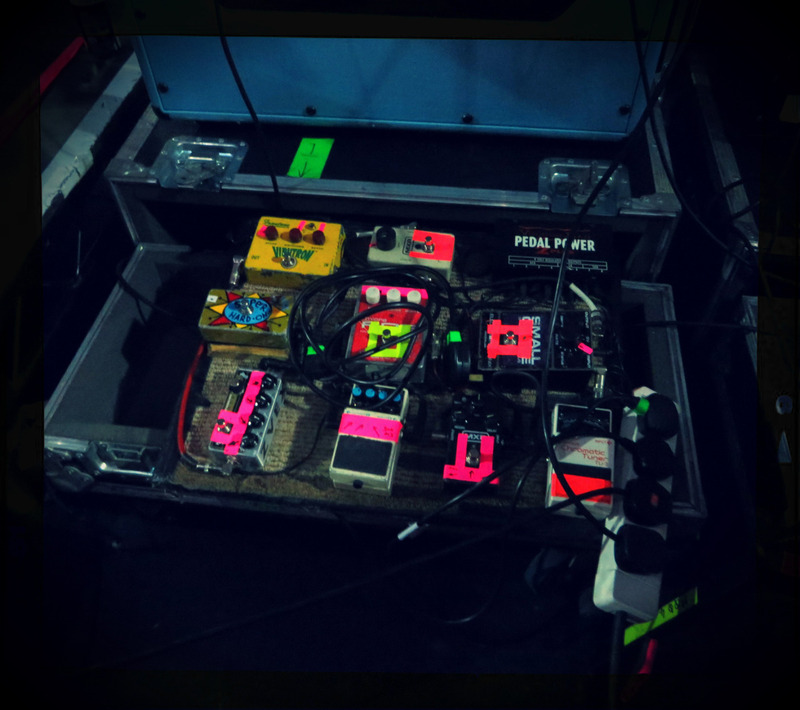 pfft"
In this photo, which shows the custom-made pedalboard from Mike Hill (source [here](http://mikehillservices.com/latest-rig-build-25-w.asp)), the EHX Small Clone chorus pedal can be seen. By 1985 he was also using an Ibanez Stereo Chorus pedal and an Electo-Harmonix Small Clone Mini-Chorus. For the recording of Metal Circus (and subsequent recordings) a harmonizer was fed directly into the recording desk. Later on a rack mounted harmonizer was used on stage. By 1987 a Roland SDE-1000 digital delay had also been added to Bob's stage gear. In this pedal photo posted by Cheney on his Instagram account, one of the pedals that can be seen is the EHX Small Clone analog chorus. Starting around 5:20 Rob plays around with the Electro-Harmonix Small Clone Analog Chorus in this #product-demo. what you want more (polychorus) ? Can be seen at 0:02 in the video. In his board he's got an EHX Small Stone (big box version) as a phaser pedal. Brendan uploaded this picture to Instagram on 16th March 2015 listing some items that were stolen from a house gig that MoBo played. 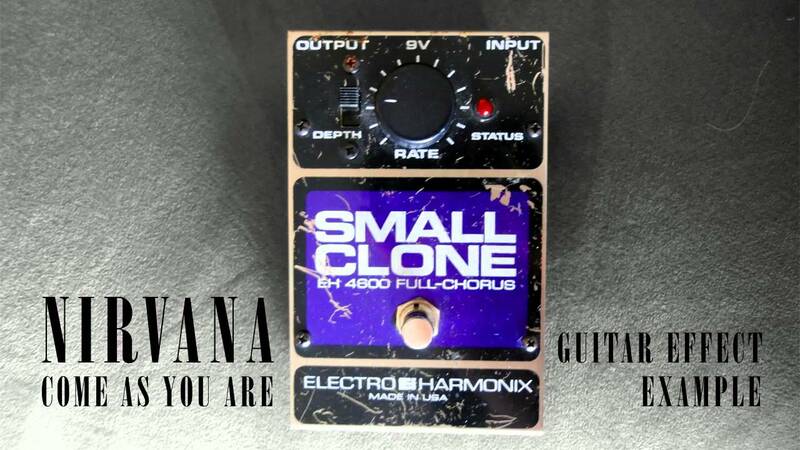 In the list was the Electro Harmonix Small Clone EH 4600 Full-Chorus. So unsure whether Brendan still uses one since it was stolen but he used one prior to this picture. We see a glimpse of his pedal board at 1:25 in this video. In an image accompanying [this interview with Reverb.com](https://reverb.com/news/drab-majesty-talks-chorus-pedals-casio-synths-and-the-selfless-act-of-songwriting), Andrew Clinco's effects setup includes a Small Clone. 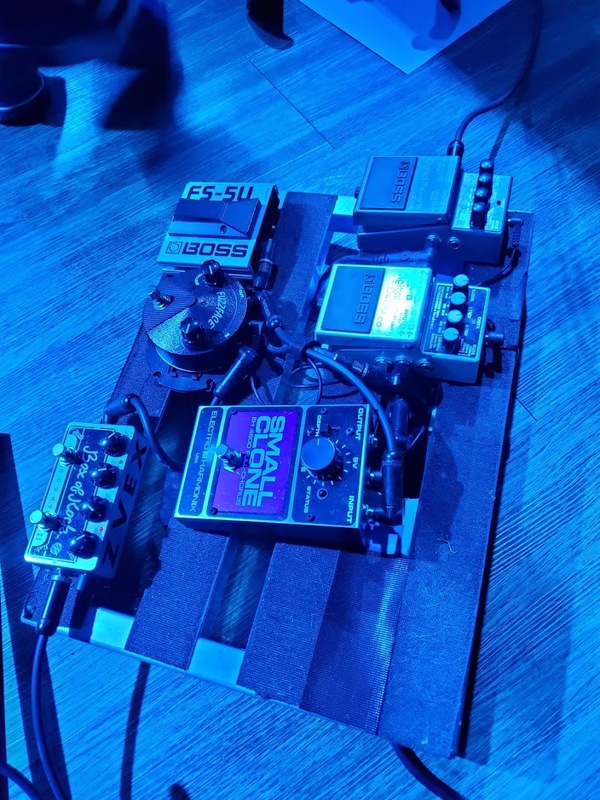 In this picture the pedal can be seen on Sergio's pedal board. During The Reckless Tour. Közi uses this pedal with Dalle. Seen on pedalboard and mentioned [in this article](http://www.effectsbay.com/2015/11/nick-thieneman-young-widows-pedalboard-2015/#prettyPhoto). The classic chorus! Analog chorus pedal popularized by Kurt Cobain. The finest analog chorus sounds: from clear, rich and dimensional to warm pulsating warbles, can be intensified with the Depth Control. Simple tweaks generate exciting doubling effects. Chiming 12-string tone, or Leslie-like warbles. Great quality and aesthetics, very simple to use; but not limited when it comes to sound. Only con is the clic when you activate the pedal, but it's only when you have just plugged the pedal to AC; just push it on the soundcheck and you won't have any trouble on the show. This pedal is a staple part of my musical diet, and I love how simple it is. It has one single turn dial, and a switch to turn the full chorus effect on or off. It has a distinct sound I have not heard anywhere else in other chorus pedals. Chorus love that because it is simple to adjust, and fits fully into everything I need with effects for my guitar solos. Kurt used them on Smells Like Teen Spirit. Enough said. Very rich sounding Chorus pedal. With a good amount of diversity in sound. I tend to use lower settings just to thicken my sound a little and really punch the effect up for creepy, stark sounding Cramps and Dead Kennedy's style riffing. One knob, one toggle, super easy. Oh and I love how EHX pedals look. It's not small, but it gives very good and bright chorus sound. It was my first chorus pedal for my bass guitar and I absolutely love it. Not so many options, but it sounds great enough to forget about another knobs. Great sound for a simple pedal. It is easy to use with a big single knob and a switch. Little effect but strong. To making sound like Kurt Cobain or John Frusciante. Very well tremolo when the settings are in max. In waiting of the real vintage Electro-Harmonix Polychorus. For me, this is the best chorus sound in the world. This pedal's so great I bought a new one after a stepped on my old one a little too hard. Worth all the praise it gets, but if you're going to get one, either put it further to the top of your board or use some reserve when stomping on it. the original style EHX boxes are certainly flimsy... it helps to open them up and put a big piece of Styrofoam under the switch so it has some support. As awesome as I expected it to be. It's really impressive, that all the good opinions about this pedal were true. Even though it has only one knob and one switch, it's extremely versatile. Want some Beatles-like Leslie tones? No problem. You're after Uni-Vibe sounds of David Gilmour? Here you go. Or maybe you're fan of The Police? Say no more. And we can't forget about this pedal being used by Kurt Cobain on many of Nirvana records, with "Come As You Are" being probably most recognizable. Just set the Depth switch up, Rate knob at 10 o'clock and you get the famous sound. Lovely pedal. Pretty much Nirvana in a box. Nice but not very diverse. Can get any chorus sound I want out of this classic pedal. Nice sounding chorus, be careful, it tends to pop every firts time you activate. If you only want to buy one Chorus pedal, this ain't it. It does sound good, but it is too simple to fulfil all the jobs you may want a Chorus to cover. I have mine permanently strapped to a synth to thicken things up a bit. Great for Pearl Jam, Nirvana, and just about any grunge covers. Really helps get that shimmering, watery, Chorus effect. I'd recommend it to anyone, even those that don't play guitar. I wanted to get some of that great Joy Division chorused bass sound whilst keeping with a simple to use pedal. Wonderfully I was able to have both in the same unit as Peter Hook uses (the Small Clone and Clone Theory use the same circuitry) and the design sure is easy to use. I loved this pedal more than life itself. I was devastated when my pedalboard got knocked off of a table backstage and this was destroyed. I plan on getting another one once I have the money. cheap n great! Though you don't get a lot of control the depth you can easily mod it and put a potentiometer in. Is a great chorus, absolute lovely sound, just have an issue with the volume which dropped down when activate, but fixed it replacing a 10k resistor on the board with a 6.8k resistor. Honestly is a must have for your pedalboard. It's an unreal chorus that is best sounding when used on distorted or fuzzy tones, at least for me. You can nail that Alex Lifeson post 1977 Rush sound from Hemispheres and Motion Pictures here. You can also nail the Electric Mistress sound from the Pink Floyd records (the sound of the Mistress on those Wall and Animals records was much more confined and not so swirly and out of control sounding, it would give a truly dated sounding 80s Flanger sound if used stupidly, which Gilmour DID do live a bunch of occasions). But this pedal nails those sounds from the actual records, the refined, yet glowing 3-dimensional sounds. So good for a Leslie Speaker too, it can literally rip off the sound of Paul McCartney and Wings' weird song Loup 1st Indian on the Moon which has an ahead of its time delapidated chorus tone. I doubt ill ever get another chorus ever. I've had it since 2012 and it's lasted me without a single issue. Although it must be said, get an ISPOT battery chain so you can use one of those adapters to the 9volt slot, otherwise you'll be stuck having to use batteries. I love the deep sound it gives but, when i use it with an overdrive or distortion, either a Fuzz, it shows an unwanted treble sound. Solid chorus pedal for the price that will give you the same tone as Cobain on Nevermind. Also good for emulating any of the tones of '80s shoegaze as well as The Police. I have the reissue one from about 2008. I know everyone says that to get the 'Cobain' sound you must have the Depth switch to 'full', but on mine that seems to produce an unusable detuned warble! I keep it on the 'normal' depth and turn the rate up, and that seems to me to be closer. Yes, it's a classic chorus pedal, unmistakeably 'analogue' in character. It doesn't sound as good as the Way Huge Blue Hippo or the Walrus Audio Julia though; those are sweet. On the other hand, it doesn't cost as much! It's as hissy as anything, too. Go for a BOSS chorus if this bothers you; what you sacrifice in richness you gain in cleanness. the old small clones do THAT sound with THOSE settings.... the new ones are harsh and extreme. I know, I've had a new one around for a long time and I never use it. I have no idea what EHX changed. None pf the reissue pedals sounda s good as 70s and 80s models other than the LPB1 and its relatives like the muff fuzz.